These addictive blondies are an excellent way to use up leftover Halloween candy, or to make any themed event more festive. 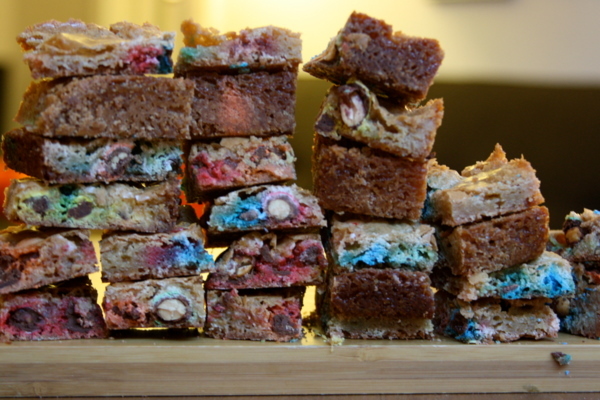 Use regular M&M’s in a single shade and all of a sudden you have green blondies for St. Patty’s Day and red blondies as the perfect Valentine’s Day gift for all your girlfriends. Preheat the oven to 325°F. Grease a 9×13″ baking pan. Use a smaller baking pan for thicker blondies—just bake a bit longer. Combine the brown sugar and butter in a small saucepan. Heat over medium heat until the butter is melted and combined and the whole mixture just begins to bubble. Remove and let come to room temperature. This will take about 20 minutes; speed it up in the fridge if need be. When the butter and sugar have cooled, beat in the eggs and vanilla. Add the flour and salt, then gently stir in the M&Ms. Pour into the prepared pan and bake 25-30 minutes, until the top has gotten slightly puffed and crusty. Cool, and cut into small rectangles. mine are flat. not cooked all the way. and sorta crumbly. what had happened?